Bennett: Our goal – to bring back Israel’s Jewish spirit with accessible, friendly religious services. Shas party MK Yaakov Margi handed the Ministry for Religious Services over to Bayit Yehudi (Jewish Home) party chairman Naftali Bennett in a ceremony Tuesday. 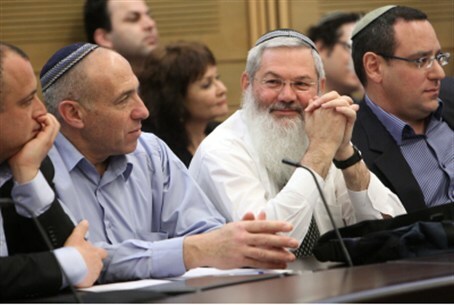 Bennett will serve as minister, and MK Eli Ben-Dahan (Bayit Yehudi), an ordained rabbi, will serve as deputy minister. The transfer represents a victory for Bayit Yehudi, which has been publicly at odds with Shas since before the elections over the ties between religion and the state in Israel. Bayit Yehudi openly seeks change to the Rabbinate, which it says has become irrelevant to most Israelis. Bennett welcomed his new role. “This is a great opportunity to sanctify G-d’s name and to make Judaism accessible to every citizen of Israel,” he declared.